You would be happy to know that since my ordination, under Rose Ministries, I have begun an independent ministry in my community. With that, I have established a location for this ministry and a branch of a Bible College and Seminary. In February my assistant and I will be taking training from the home office so that upon our return we will be able to begin registering students and hiring instructors for classes. God Bless You! Thank you! Rev. M. Roy, Ph. D.
I am very pleased to say that everything worked out beautifully in the end. I was able to become official with the newest letters that you sent me and the wedding went ahead as planned. A great success! Thank you for all your hard work. You made a lot of people very happy indeed. I received your letters in the mail Monday morning August 29th & I rushed over to the City Clerk’s office. Thank you so much — everything went smoothly & it was all a success! I even thanked [my friend] for recommending me to your ministry. Once again - God Bless & thank you for providing a way for female clergy to practice their beliefs. Thank You so much, ... it is so hard for women in ministry, but praise be to God, he can open a door that no man can shut! What a blessing it is to know that more women are involved in a world where our voices are needed. My mother asked me to marry her and because of your beautiful work, I can. Thank you. Become an Ordained Minister, officiate wedding ceremonies for friends and family members, or provide services to those in need. The process is simple and quick. As a legally licensed member of the clergy, you are able to perform religious rites, including marriages, funerals, and baptisms. Once ordained, you will be legally recognized virtually anywhere as a minister. Simply choose a package below to begin. Rose Ministries is a non-denominational ministry committed to the rights of the individual to experience the divine according to their own personal beliefs. 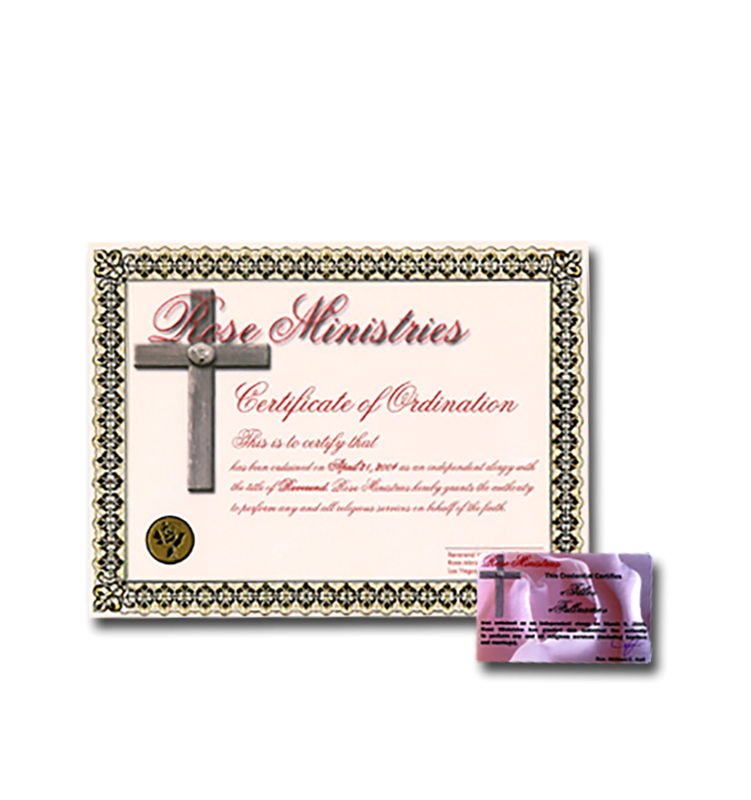 As a minister ordained by Rose Ministries you can start your own church, preside at weddings, or conduct any religious ceremony. Whether for a single ceremony or as a business, ordination grants you the full rights and privileges accorded ministers and priests of any major religion. 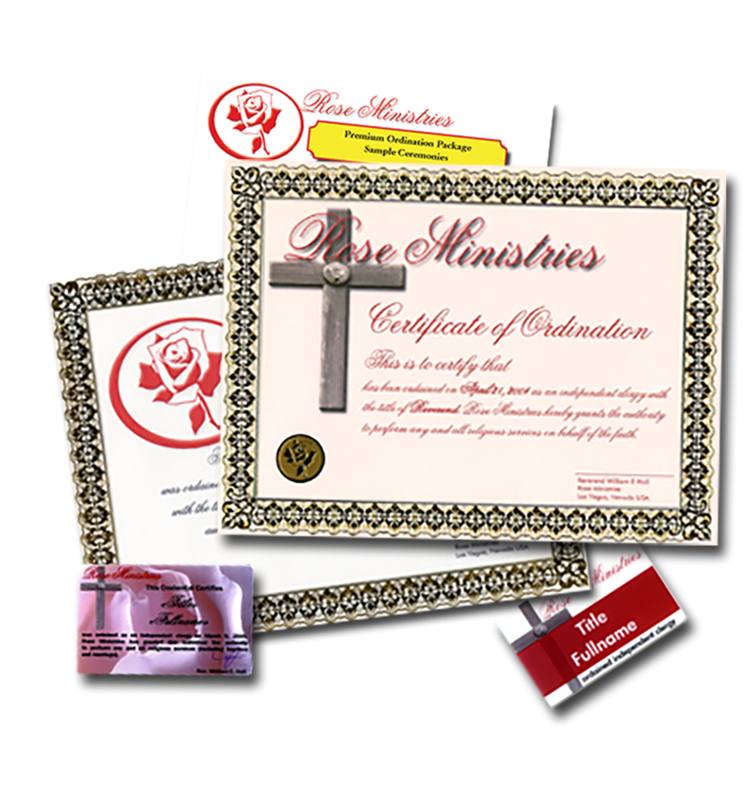 With the credentials granted as part of your Rose Ministries ordination, you can legally provide all manner of religious services, and form a church, as a full or part-time business. You may qualify for tax-free status, and even accept money for your services. Rose Ministries was formed to support individuals in forming a ministry according to their own calling and beliefs. Encouraging the pursuit of truth by all, without the prejudices and discriminations of the major denominations. 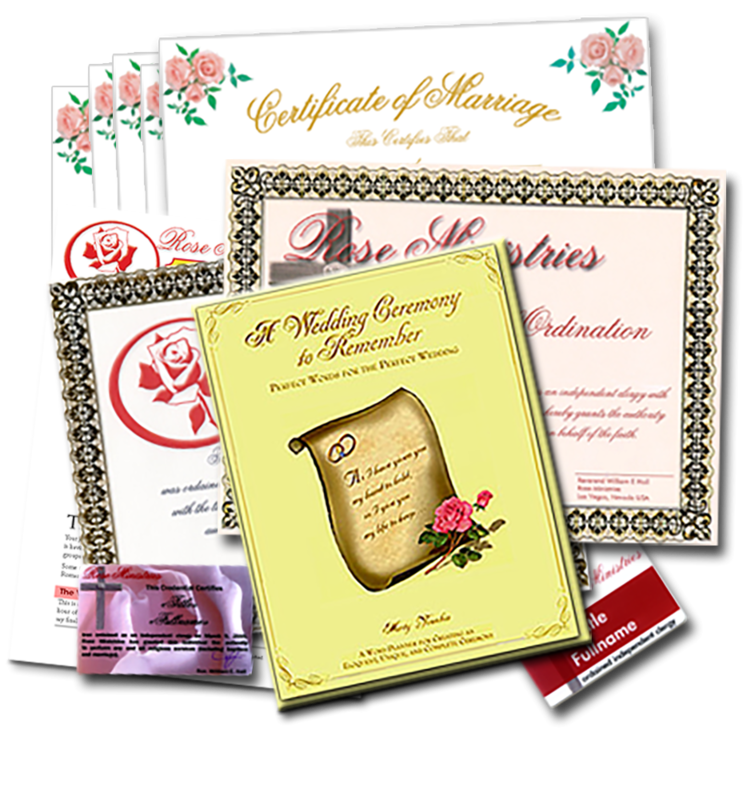 Certificate and cards imprinted with your name, title , and member ID. 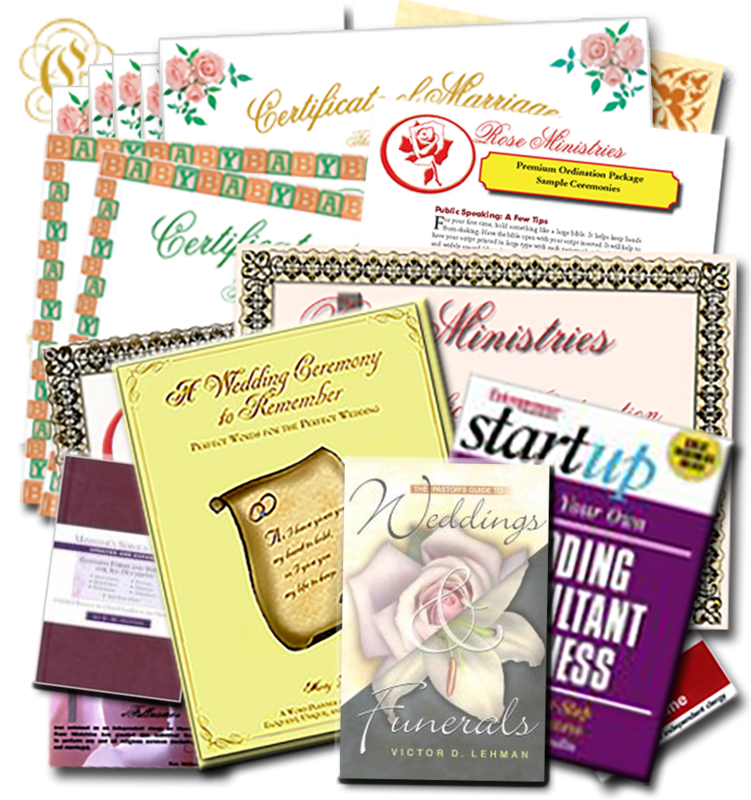 Available downloadable (customizable) files: Wedding and Baptism certificates; and Sample wedding, funeral, and baptism ceremonies. 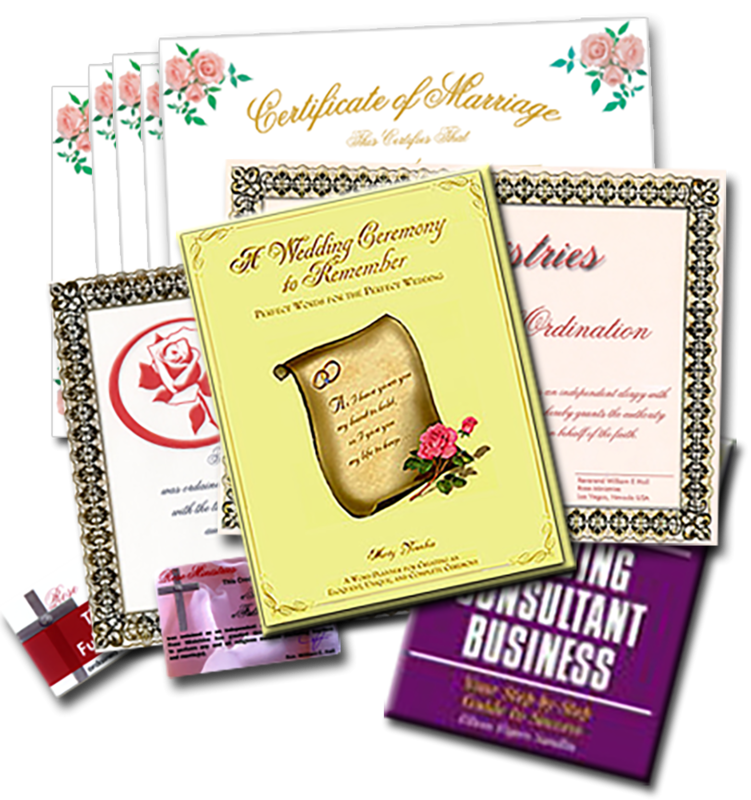 Includes everything you need to start your own Wedding Consultant Business, whether full or part-time. This is an ideal home-based business. Also includes Start Your Own Wedding Consultant Business: Your Step-By-Step Guide to Success. Say “I Do” to Success. From wedding bells to wedding bills, gain an inside look at the billion dollar wedding industry and learn how to earn your next pay check coordinating the “big” day of today’s brides and grooms. Discover the newest wedding trends, such as destination weddings, tapas-style catering, disposable video cameras, wedding logos and more. Plus, learn everything else you need to know to start and run a successful wedding consultant business. Includes everything you need to start a Full-Service Ministry, with resources to perform Weddings, Baptisms, Funerals, Worship Services and more. Includes Minister's Service Manual, by Samuel Ward Hutton, is a compact and valuable resource for ministers. It contains 250 pages packed with information that you will refer to again and again. It contains six chapters covering marriages, illness and funerals, special occasions, church procedures, leading public worship and record keeping. Also includes The Pastor's Guide to Weddings and Funerals, by Victor D. Lehman. This field guide offers both theological perspective and practical ideas, including helpful checklists and practical resources, suggested songs and Scriptures, sermon outlines and sample wedding vows, and funeral services-all designed to help you create tailor-made ceremonies and services. 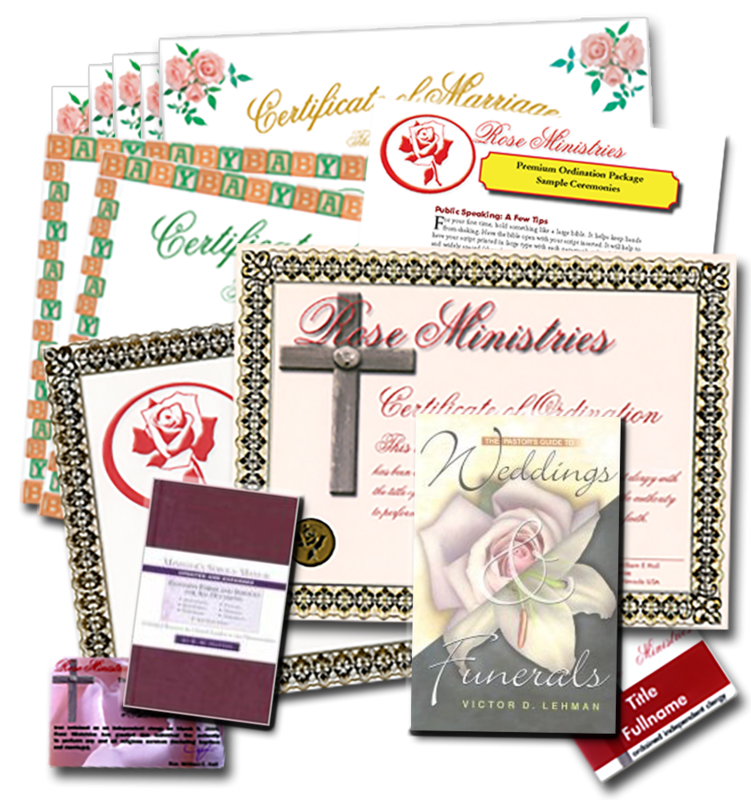 The Ultimate Minister's Package, with resources to perform Weddings, Baptisms, Funerals, Worship Services and more. Includes everything in the Full-Service Minister's Package, and more. Minister's Service Manual, by Samuel Ward Hutton, is a compact and valuable resource for ministers. It contains 250 pages packed with information that you will refer to again and again. It contains six chapters covering marriages, illness and funerals, special occasions, church procedures, leading public worship and record keeping. The Pastor's Guide to Weddings and Funerals, by Victor D. Lehman. This field guide offers both theological perspective and practical ideas, including helpful checklists and practical resources, suggested songs and Scriptures, sermon outlines and sample wedding vows, and funeral services-all designed to help you create tailor-made ceremonies and services. Entrepreneur Magazine's Start Your Own Wedding Consultant Business by Eileen F. Sandlin. It's the most special day in many couples' lives and everything needs to be perfect. But with weddings becoming larger, costlier, and more complex, many would-be newlyweds are turning to professional wedding consultants for help. This book shows you what you need to know to start and run a successful wedding consultant service. Perform wedding ceremonies. Officiate in all 50 states. Share your personal religious beliefs with others. Earn the respect automatically accorded members of the clergy. Qualify for tax free status as religious order. Earn Money. If you wish, you can legally charge for the religious rites you perform; including weddings, funerals, services, and more! Lead, (even create your own! ), religious ceremonies and rites as a legally ordained member of the clergy. Open a church to spread the fellowship of believers. As a Pastor, Minister, Cleric, Priest, Clergy-Member, Bishop: Ordained Clergy Members everywhere are provided preferred treatment, even price discounts, as a show of respect towards legally ordained religious leaders. Begin a prison ministry and bring hope and faith to those within. Choose your own title: Minister, Reverend, Pastor, Cleric... you decide. WHAT MAKES Rose Ministries ORDINATIONS LEGAL? The short answer is "Yes". Our ordinations are accepted in all 50 states. Some localities do require additional credentials, such as a Statement of Good Standing, which we provide as necessary. What Makes our Ordinations Legitimate? First let’s touch on the legal, and then we can address the spiritual. Legally, the constitution of the U.S. prevents the government from regulating the practice of religion this includes prohibiting an establishment of criteria for ordination. The judge went on to say that online ordinations were analogous to "to mass conversions at a typical revival or religious crusade" and was therefore a valid practice permitted under the U.S. Constitution. That said many of the large denominations may not recognize your ordination. Some of them do not even recognize ordinations by other major denominations! That is their right, and in no way affects the legal status of your ordination. How you conduct yourself will, in large part, determine how well you are accepted by other churches. Spiritually, neither Jesus, nor his disciples, nor any of the founding fathers of the Christian church, were formally ordained. The Bible commends all to go forth and spread the word. It does not specify that this responsibility is only for the ordained. Ordination is a function of organized religion to ensure that those speaking for that particular religion or sect are authorized and qualified to do so. If (when?) you have a large organization -- you will want that control too! Some localities, in order to register as a wedding officiate, will require that the clergy member establish a local congregation. Though your congregation may be just you and the wedding party initially, that is a congregation. Does the IRS have a Role? Some would have you believe that the Internal Revenue Service determines the legitimacy or legality of a ministry and its ordinations. Nothing could be further from the truth. The IRS only determines whether an organization qualifies for tax exemption, nothing more. Not all organizations will qualify. Not all organizations choose to request tax exempt status. Not qualifying or applying for a tax exemption does not establish your legal status. The IRS definitely does not decide "right to ordain". The constitution, as the U.S. District Court ruled, establishes that Rose Ministries has the right to ordain, according to our requirements and beliefs. Our society has come to recognize this practice by organized religion and has even codified requirements for ordination in order for an individual to be authorized for certain practices or privileges (notably officiating a wedding). Organized denominations, generally, do not allow for individuals to express their personal beliefs and feelings towards religion. Rather, they understandably prefer that the canon of their organization be perpetuated. Hopefully, we fulfill that role, enabling individuals to pursue truth as they are led. Minister, Reverend... What to call the ordained? Minister, Reverend, Cleric, Chaplian? What do they all mean? The definitions here are not definitive; many of the major denominations apply their own meanings, others have picked up differing connotations based on the traditions which use the term. Once you decide to be ordained, this list can help you decide on an appropriate title for your ministry. Originally, “Kahuna” was the Hawaiian title for a shaman, and the term is still used in that context by some native Hawaiians. in Christianity, an archbishop is an elevated bishop, responsible for all churches belonging to a religious group of a particular district. a clergy member ministering to some institution. Get Ordained Today Just choose one of the packages above. Our ordinations are legal and recognized in all 50 states. Understand local Marriage Laws See our FAQ for each state’s marriage laws. If required, Register with the County Clerk Typically you simply show the credentials, included with your Ordination Package, to the local county clerk and return the completed marriage license in a timely manner. In some cases there may be additional requirements, such as a Statement of Good Standing or a Letter of Congregational Authorization. If you encounter the need for additional documentation let us know, generally we can assist you in providing these letters. To make sure that everything goes smoothly, we also recommend that you check with the county clerk where the ceremony will be held. Just let them know that you are a newly ordained clergy and ask for details completing and returning the marriage license. Performing the Wedding Ceremony Our ordination packages provide sample ceremonies you can customize to meed the need of your celebrants. We also include some public speaking tips with our packages to help you with your first few ceremonies. After the Ceremony After the wedding it will be your responsibility to file the signed marriage certificate as required by the county clerk's office. Typically the clerk will require that the marriage certificate be filed within 3-days. Remember the marriage is not official until recorded at the clerk's office. Click a state or locality below for full details. Persons authorized to solemnize marriages. (a) Generally. Marriages may be solemnized by any licensed minister of the gospel in regular communion with the Christian church or society of which the minister is a member, by a judge of the Supreme Court, Court of Criminal Appeals, Court of Civil Appeals, any circuit court or any district court within this state, by a judge of any federal court, or by a judge of probate within his or her county, or any retired judge of the Supreme Court, retired judge of the Court of Criminal Appeals, retired judge of the Court of Civil Appeals, retired judge of the circuit court, retired judge of the district court within this state or a retired judge of probate within his or her county. (b) Pastor of religious society; clerk of society to maintain register of marriages; register, etc., deemed presumptive evidence of fact. Marriage may also be solemnized by the pastor of any religious society according to the rules ordained or custom established by such society. The clerk or keeper of the minutes of each society shall keep a register and enter therein a particular account of all marriages solemnized by the society, which register, or a sworn copy thereof, is presumptive evidence of the fact. Sec. 25.05.261. Who may solemnize. (a) Marriages may be solemnized (1) by a minister, priest, or rabbi of any church or congregation in the state, or by a commissioned officer of the Salvation Army, or by the principal officer or elder of recognized churches or congregations that traditionally do not have regular ministers, priests, or rabbis, anywhere within the state; (2) by a marriage commissioner or judicial officer of the state anywhere within the jurisdiction of the commissioner or officer; or (3) before or in any religious organization or congregation according to the established ritual or form commonly practiced in the organization or congregation. (b) This section may not be construed to waive the requirements for obtaining a marriage license. Sec. 25.05.271. Duty of officiating person before ceremony. The officiating person shall determine that the parties presenting themselves to be married are the parties named in the license. If the officiating person knows of a legal impediment to the marriage, the officiating person may not perform the ceremony. 25-124. Persons authorized to perform marriage ceremony; definition A. The following are authorized to solemnize marriages between persons who are authorized to marry: 1. Duly licensed or ordained clergymen. In California, it is the ordination or investment by the denomination that gives each clergy member the authority to perform the marriage rite. Family Code, Sections 400-402 are the statutes pertaining to whom can solemnize a marriage in California. 420. A priest, minister, or rabbi of any religious denomination. No particular form for the ceremony of marriage is required for solemnization of the marriage, but the parties shall declare, in the presence of the person solemnizing the marriage and necessary witnesses, that they take each other as husband and wife. 421. Before solemnizing a marriage, the person solemnizing the marriage shall require the presentation of the marriage license. If the person solemnizing the marriage has reason to doubt the correctness of the statement of facts in the marriage license, the person must be satisfied as to the correctness of the statement of facts before solemnizing the marriage. For this purpose, the person may administer oaths and examine the parties and witnesses in the same manner as the county clerk does before issuing the license. (a) The fact, date (month, day, year), and place (city and county) of solemnization. (b) The names and places of residence of one or more witnesses to the ceremony. (c) The official position of the person solemnizing the marriage, or of the denomination of which that person is a priest, minister, rabbi, or member of the clergy. (d) The person solemnizing the marriage shall also type or print the person's name and address. 423. The person solemnizing the marriage shall return the marriage license, endorsed as required in Section 422, to the county recorder of the county in which the license was issued within 10 days after the ceremony. 424. At the request of, and for, either party to a marriage, the person solemnizing the marriage shall issue a marriage certificate showing the facts specified in Section 422. 14-2-109. Solemnization and registration. Statute text (1) A marriage may be solemnized by a judge of a court, by a court magistrate, by a retired judge of a court, by a public official whose powers include solemnization of marriages, by the parties to the marriage, or in accordance with any mode of solemnization recognized by any religious denomination or Indian nation or tribe. Either the person solemnizing the marriage or, if no individual acting alone solemnized the marriage, a party to the marriage shall complete the marriage certificate form and forward it to the county clerk and recorder within sixty days after the solemnization. Any person who fails to forward the marriage certificate to the county clerk and recorder as required by this section shall be required to pay a late fee in an amount of not less than twenty dollars. An additional five-dollar late fee may be assessed for each additional day of failure to comply with the forwarding requirements of this subsection (1) up to a maximum of fifty dollars. For purposes of determining whether a late fee shall be assessed pursuant to this subsection (1), the date of forwarding shall be deemed to be the date of postmark. Sec. 46b-22. (Formerly Sec. 46-3). Who may join persons in marriage. Penalty for unauthorized performance. (a) All judges and retired judges, either elected or appointed and including federal judges and judges of other states who may legally join persons in marriage in their jurisdictions, family support magistrates, state referees and justices of the peace may join persons in marriage in any town in the state and all ordained or licensed clergymen, belonging to this state or any other state, so long as they continue in the work of the ministry may join persons in marriage. All marriages solemnized according to the forms and usages of any religious denomination in this state, including marriages witnessed by a duly constituted Spiritual Assembly of the Baha'is, are valid. All marriages attempted to be celebrated by any other person are void. 572-12 By whom solemnized. A license to solemnize marriages may be issued to, and the marriage rite may be performed and solemnized by any minister, priest, or officer of any religious denomination or society who has been ordained or is authorized to solemnize marriages according to the usages of such denomination or society, or any religious society not having clergy but providing solemnization in accordance with the rules and customs of that society, a legislator or constitutional officer of the State, or a member of the United States Congress who represents a district within the State, while that person holds office, or any justice [or], judge, or magistrate, active or retired, of a state or federal court in the State, upon presentation to such person or society of a license to marry, as prescribed by this chapter. Such person or society may receive the price stipulated by the parties or the gratification tendered." For the purpose of preserving the evidence of marriages in the District of Columbia, every minister of any religious society approved or ordained according to the ceremonies of his religious society, whether his residence is in the District of Columbia or elsewhere in the United States or the territories, may be authorized by any judge of the Superior Court of the District of Columbia to celebrate marriages in the District of Columbia. Marriages may also be performed by any judge or justice of any court of record; provided, that marriages of any religious society which does not by its own custom require the intervention of a minister for the celebration of marriages may be solemnized in the manner prescribed and practiced in any such religious society, the license in such case to be issued to, and returns to be made by, a person appointed by such religious society for that purpose. The Clerk of the Superior Court of the District of Columbia or such deputy clerks of the Court as may, in writing, be designated by the Clerk and approved by the Chief Judge, may celebrate marriages in the District of Columbia. All regularly ordained ministers of the gospel or elders in communion with some church, or other ordained clergy, and all judicial officers, including retired judicial officers, clerks of the circuit courts, and notaries public of this state may solemnize the rights of matrimonial contract, under the regulations prescribed by law. The license shall be directed to any judge, including judges of state and federal courts of record in this state, city recorder, magistrate, minister, or other person of any religious society or sect authorized by the rules of such society to perform the marriage ceremony; such license shall authorize the marriage of the persons therein named and require the judge, city recorder, magistrate, minister, or other authorized person to return the license to the judge of the probate court with the certificate thereon as to the fact and date of marriage within 30 days after the date of the marriage. The license with the return thereon shall be recorded by the judge in a book kept by such judge for that purpose. 32-303. BY WHOM SOLEMNIZED. Marriage may be solemnized by either a current or retired justice of the supreme court, a current or retired court of appeals judge, a current or retired district judge, any federal judge, the current or a former governor, lieutenant governor, a current or retired magistrate of the district court, mayor, priest or minister of the gospel of any denomination. To be a retired justice of the supreme court, court of appeals judge, district judge or magistrate judge of the district court, for the purpose of solemnizing marriages, a person shall have served in one (1) of those offices and shall be receiving a retirement benefit from either the judges retirement system or the public employee retirement system for service in the judiciary. IC 31-11-6-1 Persons authorized to solemnize marriages Sec. 1. Marriages may be solemnized by any of the following: (1) A member of the clergy of a religious organization (even if the cleric does not perform religious functions for an individual congregation), such as a minister of the gospel, a priest, a bishop, an archbishop, or a rabbi. (2) A judge. (3) A mayor, within the mayor's county. (4) A clerk or a clerk-treasurer of a city or town, within a county in which the city or town is located. (5) A clerk of the circuit court. (6) The Friends Church, in accordance with the rules of the Friends Church. (7) The German Baptists, in accordance with the rules of their society. (8) The Bahai faith, in accordance with the rules of the Bahai faith. (9) The Church of Jesus Christ of Latter Day Saints, in accordance with the rules of the Church of Jesus Christ of Latter Day Saints. (10) An imam of a masjid (mosque), in accordance with the rules of the religion of Islam. 595.10 Who may solemnize. Marriages may be solemnized by: 1. A judge of the supreme court, court of appeals, or district court, including a district associate judge, associate juvenile judge, or a judicial magistrate, and including a senior judge as defined in section 602.9202, subsection 3. 2. A person ordained or designated as a leader of the person's religious faith. 23-104a. Solemnizing marriage; persons authorized to officiate. (a) Marriage may be validly solemnized and contracted in this state, after a license has been issued for the marriage, in the following manner: By the mutual declarations of the two parties to be joined in marriage, made before an authorized officiating person and in the presence of at least two competent witnesses over 18 years of age, other than the officiating person, that they take each other as husband and wife. (b) The following are authorized to be officiating persons: (1) Any currently ordained clergyman or religious authority of any religious denomination or society; (2) any licentiate of a denominational body or an appointee of any bishop serving as the regular clergyman of any church of the denomination to which the licentiate or appointee belongs, if not restrained from so doing by the discipline of that church or denomination; (3) any judge or justice of a court of record; (4) any municipal judge of a city of this state; and (5) any retired judge or justice of a court of record. (c) The two parties themselves, by mutual declarations that they take each other as husband and wife, in accordance with the customs, rules and regulations of any religious society, denomination or sect to which either of the parties belong, may be married without an authorized officiating person. See state site for details. 551.7 Persons authorized to solemnize marriage; records; returns; disposition of fees charged by mayor or county clerk. (h) A minister of the gospel, anywhere in the state, if the minister is ordained or authorized to solemnize marriages according to the usages of the denomination, and is a pastor of a church in this state, or continues to preach the gospel in this state. (i) A minister of the gospel, anywhere in the state, if the minister is not a resident of this state but is authorized to solemnize marriages under the laws of the state in which the minister resides. It appears that a charter must be filed with the state before an ordination will be recognized, for the purposes of officiating weddings. "An ordained minister of the gospel recognized by a church that has filed a charter with the State of Michigan, Corporation and Land Development Bureau or an elected government official may perform marriages. To determine if a church has filed a charter (517) 241-6470. Contact the Department of Community Health, Vital Statistics at (517) 335-8677 for marriage statistics. When forming a religious organization, there is a tax guide available from the IRS, publication "tax Guide For Churches and Other Religious Organizations; Publication 1828 Catalog Number 21096G; address: IRS, Freedom of Information Reading Room, P.O. Box 795, Ben Franklin Station, Washington, D.C. 20044; telephone: (800) 829-3676. Many churches are required to have a "Church Copyright License." For further information about this license call (800) 234-2446. Marriage licenses are obtained at the county clerk's office. This may not be required if you are only intending to officiate weddings. A license can be obtained from The CCLI. 450.178 Ecclesiastical corporations; incorporation; purpose. Sec. 178. Ecclesiastical corporations. Any number of persons, not less than 3, may incorporate for the purpose of establishing any church organization for the purpose of teaching and spreading their religious beliefs and principles. Every such corporation shall be a non-profit corporation and subject to the provisions of this act relating to non-profit corporations generally except as specifically otherwise provided. The term church and/or church organization used in this act shall be construed to include any church, denominational unit, or church society as the term is commonly used and understood but shall not apply to such organizations as Sunday schools, Epworth Leagues, Young People's Unions, Bible classes and similar societies organized by and affiliated with the parent churches. Whenever any number of churches or other corporations organized for religious purposes desire to unite in a central organization for the accomplishment of any common purpose they may incorporate such organization by severally adopting, at meetings specially called for the purpose, resolutions expressing their desire to become members of such corporation; and by filing duly attested copies of such resolutions together with a copy of the articles of such corporation, as provided for the filing of articles in section 5 of this act. The corporations formed under this section are hereinafter called ecclesiastical corporations. The form is fairly basic, requiring an address for the church (can be your address), details about how often meetings will be held ("once per week, or as necessary"), details on your church structure (you could say "under the rules of Rose Ministries" or mention the basis of your beliefs), and will require three notarized signatures. The filing fee, to the state, is currently only $20.00. See also http://www.crcna.org/whatweoffer/resources/synodical/downloads/articlesofincorporation_mi.doc for an example of completed articles. Marriages may be solemnized throughout the state by a judge of a court of record, a retired judge of a court of record, a court administrator, a retired court administrator with the approval of the chief judge of the judicial district, a former court commissioner who is employed by the court system or is acting pursuant to an order of the chief judge of the commissioner's judicial district, the residential school administrators of the Minnesota State Academy for the Deaf and the Minnesota State Academy for the Blind, a licensed or ordained minister of any religious denomination, or by any mode recognized in section 517.18. Ministers of any religious denomination, before they are authorized to solemnize a marriage, shall file a copy of their credentials of license or ordination with the court administrator of the district court of a county in this state, who shall record the same and give a certificate thereof. The place where the credentials are recorded shall be endorsed upon and recorded with each certificate of marriage granted by a minister. 451.100. Marriages may be solemnized by any clergyman, either active or retired, who is in good standing with any church or synagogue in this state. Marriages may also be solemnized, without compensation, by any judge, including a municipal judge. Marriages may also be solemnized by a religious society, religious institution, or religious organization of this state, according to the regulations and customs of the society, institution or organization, when either party to the marriage to be solemnized is a member of such society, institution or organization. 40-1-301. Solemnization and registration. (1) A marriage may be solemnized by a judge of a court of record, by a public official whose powers include solemnization of marriages, by a mayor, city judge, or justice of the peace, by a tribal judge, or in accordance with any mode of solemnization recognized by any religious denomination, Indian nation or tribe, or native group. 42-108 Marriage ceremony; who may perform; return; contents. Every judge, retired judge, or clerk magistrate, and every preacher of the gospel authorized by the usages of the church to which he or she belongs to solemnize marriages, may perform the marriage ceremony in this state. NRS 122.062 Licensed or ordained ministers and chaplains of Armed Forces to obtain certificates from county clerk; temporary replacements; solemnization by minister licensed or ordained in another state. 1. Any licensed or ordained minister in good standing within his denomination, whose denomination, governing body and church, or any of them, are incorporated or organized or established in this state, may join together as husband and wife persons who present a marriage license obtained from any county clerk of the State, if the minister first obtains a certificate of permission to perform marriages as provided in this section and NRS 122.064 to 122.073, inclusive. The fact that a minister is retired does not disqualify him from obtaining a certificate of permission to perform marriages if, before his retirement, he had active charge of a congregation within this state for a period of at least 3 years. 2. A temporary replacement for a licensed or ordained minister certified pursuant to this section and NRS 122.064 to 122.073, inclusive, may solemnize marriages pursuant to subsection 1 during such time as he may be authorized to do so by the county clerk in the county in which he is a temporary replacement, for a period not to exceed 90 days. The minister whom he temporarily replaces shall provide him with a written authorization which states the period during which it is effective. New_Jersey37:1-13 Authorization to solemnize marriages 37:1-13. Each judge of the United States Court of Appeals for the Third Circuit, each judge of a federal district court, United States magistrate, judge of a municipal court, judge of the Superior Court, judge of a tax court, retired judge of the Superior Court or Tax Court, or judge of the Superior Court or Tax Court, the former County Court, the former County Juvenile and Domestic Relations Court, or the former County District Court who has resigned in good standing, surrogate of any county, county clerk and any mayor or the deputy mayor when authorized by the mayor, or chairman of any township committee or village president of this State, and every minister of every religion, are hereby authorized to solemnize marriage between such persons as may lawfully enter into the matrimonial relation; and every religious society, institution or organization in this State may join together in marriage such persons according to the rules and customs of the society, institution or organization. 40-1-2. Clergymen or civil magistrates may solemnize; A. A person may solemnize the contract of matrimony by means of an ordained clergyman or authorized representative of a federally recognized Indian tribe, without regard to the sect to which he may belong or the rites and customs he may practice. A clergyman or minister of any religion, or by the senior leader, or any of the other leaders, of The Society for Ethical Culture in the city of New York, having its principal office in the borough of Manhattan, or by the leader of The Brooklyn Society for Ethical Culture, having its principal office in the borough of Brooklyn of the city of New York, or of the Westchester Ethical Society, having its principal office in Westchester county, or of the Ethical Culture Society of Long Island, having its principal office in Nassau county, or of the Riverdale-Yonkers Ethical Society having its principal office in Bronx county, or by the leader of any other Ethical Culture Society affiliated with the American Ethical Union. The term "clergyman" or "minister" when used in this article, shall include those defined in section two of the religious corporations law. The word "magistrate, " when so used, includes any person referred to in the second or third subdivision. "The term "clergyman" and the term "minister" include a duly authorized pastor, rector, priest, rabbi, and a person having authority from, or in accordance with, the rules and regulations of the governing ecclesiastical body of the denomination or order, if any, to which the church belongs, or otherwise from the church or synagogue to preside over and direct the spiritual affairs of the church or synagogue." Who can perform a marriage ceremony? To be valid, a marriage ceremony must be performed by any of the individuals specified in Section 11 of the New York State Domestic Relations Law. a. In the presence of an ordained minister of any religious denomination, a minister authorized by a church, or a magistrate; and b. With the consequent declaration by the minister or magistrate that the persons are husband and wife; or (2) In accordance with any mode of solemnization recognized by any religious denomination, or federally or State recognized Indian Nation or Tribe. 14-03-09. Who may solemnize marriages. Marriages may be solemnized by all judges of courts of record; municipal judges; recorders, unless the board of county commissioners designates a different official; ordained ministers of the gospel; priests; clergy licensed by recognized denominations pursuant to chapter 10-33; and by any person authorized by the rituals and practices of any religious persuasion. 3101.08. Who may solemnize. An ordained or licensed minister of any religious society or congregation within this state who is licensed to solemnize marriages, a judge of a county court in accordance with section 1907.18 of the Revised Code, a judge of a municipal court in accordance with section 1901.14 of the Revised Code, a probate judge in accordance with section 2101.27 of the Revised Code, the mayor of a municipal corporation in any county in which such municipal corporation wholly or partly lies, the superintendent of the state school for the deaf, or any religious society in conformity with the rules of its church, may join together as husband and wife any persons who are not prohibited by law from being joined in marriage. 43-7. Solemnization of marriages. A. All marriages must be contracted by a formal ceremony performed or solemnized in the presence of at least two adult, competent persons as witnesses, by a judge or retired judge of any court in this state, or an ordained or authorized preacher or minister of the Gospel, priest or other ecclesiastical dignitary of any denomination who has been duly ordained or authorized by the church to which he or she belongs to preach the Gospel, or a rabbi and who is at least eighteen (18) years of age. B. 1. The judge shall place his or her order of appointment on file with the office of the court clerk of the county in which he or she resides. 2. The preacher, minister, priest, rabbi, or ecclesiastical dignitary who is a resident of this state shall have filed, in the office of the court clerk of the county in which he or she resides, a copy of the credentials or authority from his or her church or synagogue authorizing him or her to solemnize marriages. 3. The preacher, minister, priest, rabbi, or ecclesiastical dignitary who is not a resident of this state, but has complied with the laws of the state of which he or she is a resident, shall have filed once, in the office of the court clerk of the county in which he or she intends to perform or solemnize a marriage, a copy of the credentials or authority from his or her church or synagogue authorizing him or her to solemnize marriages. 4. The filing by resident or nonresident preachers, ministers, priests, rabbis, ecclesiastical dignitaries or judges shall be effective in and for all counties of this state; provided, no fee shall be charged for such recording. § 1503. Persons qualified to solemnize marriages. (1) A justice, judge or magisterial district judge of this Commonwealth. (vi) is a resident of this Commonwealth. (3) An active or senior judge or full-time magistrate of the District Courts of the United States for the Eastern, Middle or Western District of Pennsylvania. (3.1) An active, retired or senior bankruptcy judge of the United States Bankruptcy Courts for the Eastern, Middle or Western District of Pennsylvania who is a resident of this Commonwealth. (4) An active, retired or senior judge of the United States Court of Appeals for the Third Circuit who is a resident of this Commonwealth. (5) A mayor of any city or borough of this Commonwealth. (v) is a resident of this Commonwealth. (6) A minister, priest or rabbi of any regularly established church or congregation. (b) Religious organizations.--Every religious society, religious institution or religious organization in this Commonwealth may join persons together in marriage when at least one of the persons is a member of the society, institution or organization, according to the rules and customs of the society, institution or organization. (c) Marriage license needed to officiate.--No person or religious organization qualified to perform marriages shall officiate at a marriage ceremony without the parties having obtained a marriage license issued under this part. 2004 Amendment. See section 29 of Act 207 in the appendix to this title for special provisions relating to construction of law. SECTION 20-1-20. Persons who may perform marriage ceremony. Only ministers of the Gospel or accepted Jewish rabbis and officers authorized to administer oaths in this State are authorized to administer a marriage ceremony in this State. "36-3-301. Persons who may solemnize marriages. (a) (1) All regular ministers, preachers, pastors, priests, rabbis and other spiritual leaders of every religious belief, more than eighteen (18) years of age, having the care of souls..."
"(2) In order to solemnize the rite of matrimony, any such minister, preacher, pastor, priest, rabbi or other spiritual leader must be ordained or otherwise designated in conformity with the customs of a church, temple or other religious group or organization; and such customs must provide for such ordination or designation by a considered, deliberate, and responsible act." Some online ordinations, particularly those mentioned in some news stories in the state, ordain people automaticlly online. Rose Ministries does not. We responsibly perform a deliberate and considered review of each and every ordination request, thereby meeting these requirements. You will need to have "the care of souls", that is, have a congregation. The law does not specify the size of this congregation, originally it could just be composed of you and the wedding party. State codes are unclear as to who is authorized to solemnize. Actually, they seem to be silent on the point! Visit the state site, and check with the county clerk, (where the ceremony will be held), for further details. 48-2-402. Qualifications of religious representative for celebrating marriages; registry of persons authorized to perform marriage ceremonies; special revenue fund. (a) Beginning the first day of September, two thousand one, the secretary of state shall, upon payment of the registration fee established by the secretary of state pursuant to subsection (d) of this section, make an order authorizing a person who is a religious representative to celebrate the rites of marriage in all the counties of the state, upon proof that the person: (1) Is eighteen years of age or older; (2) Is duly authorized to perform marriages by his or her church, synagogue, spiritual assembly or religious organization; and (3) Is in regular communion with the church, synagogue, spiritual assembly or religious organization of which he or she is a member. (b) The person shall give bond in the penalty of one thousand five hundred dollars, with surety approved by the commission. Any religious representative who gives proof before the county commission of his or her ordination or authorization by his or her respective church, synagogue, spiritual assembly or religious organization is exempt from giving the bond. (c) The secretary of state shall establish a central registry of persons authorized to celebrate marriages in this state. Every person authorized under the provisions of subsection (a) of this section to celebrate marriages shall be listed in this registry. Every county clerk shall, prior to the first day of October, two thousand one, transmit to the secretary of state the name of every person authorized to celebrate marriages by order issued in his or her county since one thousand nine hundred sixty and the secretary of state shall include these names in the registry. The completed registry and periodic updates shall be transmitted to every county clerk. (d) A fee not to exceed twenty-five dollars may be charged by the secretary of state for each registration received on or after the first day of September, two thousand one, and all money received shall be deposited in a special revenue revolving fund designated the "Marriage Celebrants Registration Fee Administration Fund" in the state treasury to be administered by the secretary of state. Expenses incurred by the secretary in the implementation and operation of the registry program shall be paid from the fund. (e) No marriage performed by a person authorized by law to celebrate marriages may be invalidated solely because the person was not listed in the registry provided for in this section. (f) The secretary of state shall promulgate rules to implement the provisions of this section. (1) Any ordained member of the clergy of any religious denomination or society who continues to be an ordained member of the clergy. (2) Any licentiate of a denominational body or an appointee of any bishop serving as the regular member of the clergy of any church of the denomination to which the member of the clergy belongs, if not restrained from so doing by the discipline of the church or denomination. (3) The 2 parties themselves, by mutual declarations that they take each other as husband and wife, in accordance with the customs, rules and regulations of any religious society, denomination or sect to which either of the parties may belong. Nonresident officiating person; sponsorship. Any member of the clergy, licentiate or appointee named in s. 765.16 who is not a resident of this state may solemnize marriages in this state if he or she possesses at the time of the marriage a letter of sponsorship from a member of the clergy of the same religious denomination or society who has a church in this state under his or her ministry. Delivery and filing of marriage document. The marriage document, legibly and completely filled out with unfading black ink, shall be returned by the officiating person, or, in the case of a marriage ceremony performed without an officiating person, then by the parties to the marriage contract, or either of them, to the register of deeds of the county in which the marriage was performed within 3 days after the date of the marriage. 20-1-106. Who may solemnize marriage; form of ceremony. (a) Every district or circuit court judge, district court commissioner, supreme court justice, magistrate and every licensed or ordained minister of the gospel, bishop, priest or rabbi, or other qualified person acting in accordance with the traditions or rites for the solemnization of marriage of any religion, denomination or religious society, may perform the ceremony of marriage in this state. (b) In the solemnization of marriage no particular form is required, except that the parties shall solemnly declare in the presence of the person performing the ceremony and at least two (2) attending witnesses that they take each other as husband and wife. (c) All ordained clergymen and priests of whatsoever religious faith who are recognized as such by the religious body whose faith they represent. Only those who reside in New Zealand can be registered. Only those persons appointed by the Registrar-General as Marriage Celebrants and whose names appear in the List of Marriage Celebrants in the New Zealand Gazette or at www.bdm.govt.nz have the authority to solemnise marriages in New Zealand. The Registrar-General must be satisfied that it is in the interests of the public generally, or of a particular community (whether defined by geography, interest, belief, or some other factor) that the person be appointed as a Marriage Celebrant. The Registrar-General will also take into consideration any potential conflicts of interest and apparent bias that may arise if a person is appointed, and consider whether those issues can be managed appropriately. Holding other positions of responsibility (such as being a Justice of the Peace), or completing a Certificate in Celebrant Studies does not automatically entitle you to be appointed as a marriage celebrant. To apply to be a Marriage Celebrant and if you wish, a Civil Union Celebrant, complete the Independent Marriage Celebrant and Civil Union Celebrant Joint Application BDM 453 form and post to Births, Deaths and Marriages. There is no charge for appointment and applications are only accepted from people that reside in New Zealand. How can I get married in Puerto Rico? Judges, as well as priests and ministers, are authorized by law to perform wedding ceremonies both in and out of court. Certain prerequisites must be met before such a ceremony is performed. The General Court of Justice offers information about these administrative and legal requirements. To obtain this information you may contact the office of a judge directly. For a directory of judges organized by municipality click here* and scroll to the bottom of the page. Select from amongst the municipalities listed (i.e. Aguadilla, Aibonito, Arecibo) to see the judges in that region. A marriage can take place in England and Wales at a register office, at a building approved for civil marriage, in an Anglican church or in any other religious building that is registered for the solemnisation of marriage. You will need to confirm that the location is properly registered, and that the registration is current. While our ordinations are legal in the U.K., please review the following from the U.K. General Registrar's Office web-site: All those conducting marriage ceremonies have to be duly appointed in law to an appropriate post. There are legal responsibilities which come with the duty of conducting a ceremony, and possible legal liabilities should proceedings not be carried out in line with marriage law. It would not be appropriate for someone who had not been fully trained in the necessary requirements to conduct a marriage ceremony, and therefore an appointment for a single marriage is unlikely. If you wish to marry by religious ceremony other than in the Church of England or Church in Wales, you should first arrange to see the person in charge of marriages at the building. However, the church or religious building in question must normally be in the registration district in which you or the other party live. It will also be necessary for both of you to give formal notice of your marriage to the superintendent registrar of the district(s) where you live. A registrar may also need to be booked from the register office in the district where the marriage is to take place in order to register the marriage. Please note that for a religious marriage, other than in the Church of England, civil preliminaries must be completed. One, the bride and groom can have a quite civil ceremony at the registar's office, then you can conduct a religious ceremony - without regard to the civil requirements (regarding your status and the building requirements). Or, you can hold the ceremony in a registered building, with an official registar present. Finally, review this leaflet from the Registrar's web-site, it provides details on the possibility of becoming a registrar for a registered location. Rose Ministries was formed to support individuals in forming a ministry according to their own calling and beliefs. Encouraging the pursuit of truth by all, without the prejudices and discriminations of the major denominations.